Indian Summer - Our favorite drink, all year long! 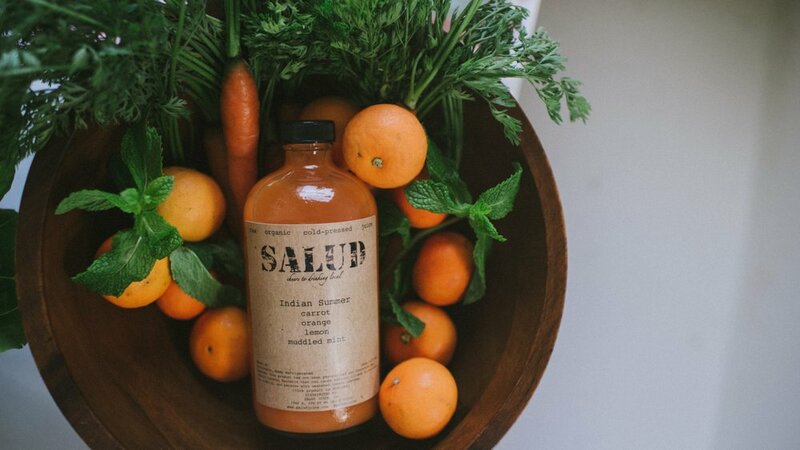 Anyone who steps foot into Salud Juice in Long Beach knows they are in a different type of juice shop. No pretense, all smiles and the whole team is extremely knowledgable about the what and why of their juice recipes. I can't stop talking about Salud and selfishly wanted my friends to be just as excited about it! Recently I went straight to the source of Salud - owner Angela Almaguer. 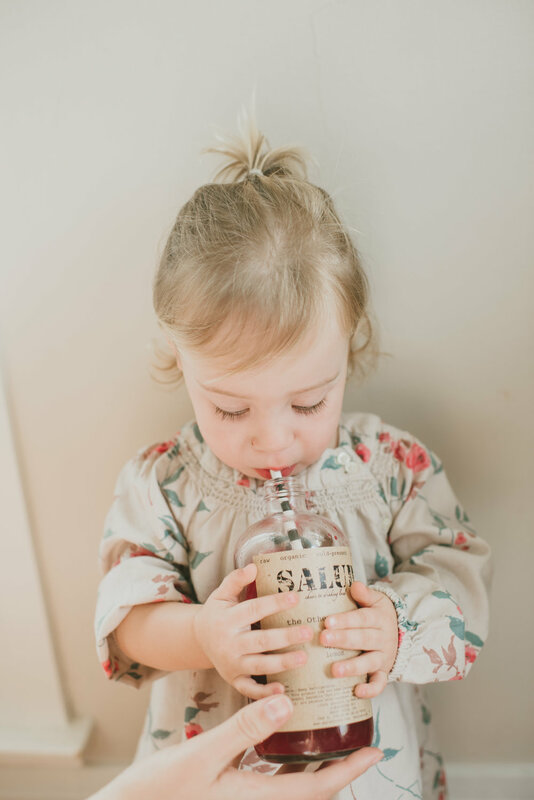 Check out our discussion below for all things juice, local and tasty. There are a lot of myths about consuming raw, unpasteurized juices. Mostly, that they aren't safe for young kids. How do you address those concerns + what do you explain to parents in your shop about the process? First and foremost, I want everyone to do what they feel is comfortable. There's no crazy science behind fresh juice. We grind the produce, press the juice out and put it in the fridge. It is alive with raw enzymes and nutrients that you wouldn't get in pasteurized juice from your grocery store. But, as with anything else that's alive, there are risks. And just like anything else you buy that's alive like spinach or an apple, you must take necessary precautions when handling it. You wouldn't eat spinach if it was wilty or moldy. And you are most likely washing your apples before you eat them. We take precautions here to make sure our produce is clean and always organic to ensure little to no harm when we bottle the final product. What is your favorite "I gotta relax ASAP so I'm going to eat/drink this..... " product at Salud? I have a couple go-to's for that! I really like drinking the Straight Up (which tastes like spicy grass) because it gives me all of my leafy greens in one bottle with a shot of ginger to get my blood moving to where it needs to be. The nutrients in the hard leafy greens helps me feel more balanced. I also go for the Comfy Cozy because we made it with all the right adaptogenic spices (herbs and spices that help your body handle stress better) to make you feel Comfy and Cozy inside! There have been so many changes to the Salud shops over the past year. (It's all awesome to watch!) What is your favorite new item (juice or food) and what should customers get excited for this upcoming Fall season? They're all my little babies so it's hard to pick! I definitely love taking the Spicy Roll tonic and heating it up at night to make a virgin hot toddy during the Fall (or add a shot of whisky if that's your jam!). All of our amazing vegan food is really evolving into something amazing. We're experimenting with fermented cheeses that is starting to take our Fall menu to another level! My favorite right now is our fermented almond feta that is just out of this world! It will be on our Fall raw fig pizza in a couple weeks and I couldn't be more proud of it! Of course, the classics are coming back as well like the Persian Pilot (pomegranate, orange, muddled basil) and the Pumpkin Spice Girl (our pumpkin almond milk) and I can't wait to see those on the shelf soon! How would you describe Long Beach to someone new to the area? Where are your top two places in town? I feel like Long Beach is magical. Without exaggeration. We have a very amazing community here that supports each other with whatever anyone wants to do. We are so open and accepting of all walks of life and I'm so grateful to be here. This is home to me. I consider a huge portion of this community to be my family! You don't get that feeling anywhere else in Southern California. As for my top two places: 1. The Attic has my heart and that's not just because my good friend and business partner, Steve Massis, owns it! The Attic represents the magical feeling of Long Beach so well. If anyone wants to know what it feels like to be in Long Beach and feel like you're part of something, The Attiic is the place to be and I think a lot of Long Beach locals can agree. They strive to be the best cuisine and always change up their menu to introduce Long Beach to another style of menu we're not used to. 2. My next favorite place is Open Sesame. I worked there from the age of 20 to 28 and I still crave it everyday! I've watched them make every dish from scratch and trust their product more than most. It is another place I consider like my second family and I've made the closest group of friends from my time there. I just love them so much! I can gush for days about both restaurants!